Hello all and here we will be continuing my 101 Content Generation Ideas with this one which is about 40 something, as I've lost count and will check when I think we're coming near a hundred! But for the purpose of finding ways to come up with ideas for content, we'll be talking about creating Decision Trees and then featuring them in posts on your site or blog. So you have probably done a Decision Tree at some point! They are online everywhere these days. Most are quite basic and simple that help you find the answer to something or troubleshoot your way to what you should do based on the answers you choose. And some are very quite complex and complicated too with many hundreds of possible answers to choose! As a fun and complex example, check out the Will You Survive The Undead Apocalypse Decision Tree. There is no such thing as safe harbor from Zombies. Over the years they’ve infiltrated peaceful towns, ominous mansions, space, and even Nazi Germany. They can spread their infection like wildfire, survive without their limbs, and they’re always hungry. The odds are not in humanity’s favor, but if you make the right decisions, you might just survive the imminent zombie apocalypse. Start by choosing where you start from and follow the arrows to each answer you want to give. Depending on the answers you give, you might not make it out alive..
And that's basically a decision tree. And if you're a website that does something for people, or provides something. And there is a "process" involved for them doing it with different possible scenarios or outcomes for each, then you could create a decision tree for that and then make a useful post about it on your site. Just think about some process that one of your customers or clients have to do to buy your products or services or something. Then think about the possible choices they will have and what each of those is, what the outcome of those choices are and then what to do for each. You'll have to just write this down in text first probably. 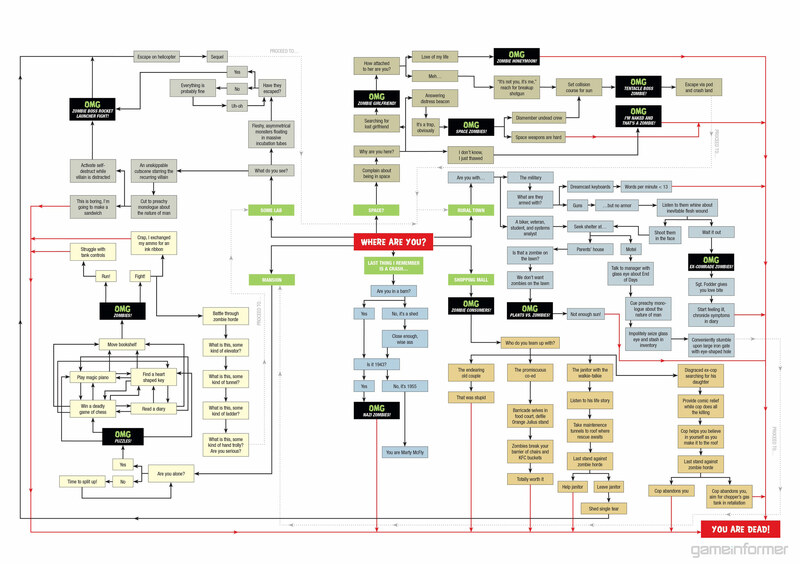 But then you can make a graphic out of it like any decision tree. Let's say that you want to create a decision tree for buying something on your site. - 1. Visit your website. - 2. Browse for product. - 3. Add to cart. - 6. Leave a review. - 7 Get a discount code. But for each of these things people could do, there could be multiple ways they could do it. So for 1, it could be using a mobile or desktop version of your site. In which case, 2 might be done differently. 3 could come with questions like, do you require more than one or what colour, size etc do you want. 4 itself could be what way you want to pay, PayPal, credit/debit card, some other way etc. 5 could mean asking do they want delivery updates and alerts or something. And 6 could have its own questions about leaving a review like whether they have properly tested it in what environment etc and the last 7 could ask something like whether they have done something like leave a review before they can get it. But that's basically how you create a decision tree! I don't want to go into super massive long detail about it as I don't think it needs much explanation as to what it is and how it works. But that basically covers it along with the knowing that using them can provide you with a great way to come up with great content all the time since you could probably create many of these! And people find them super helpful as well so I actually recommend, if you're a site/business of any kind that has processes that people have to go through to do or get something. And they all have their own scenarios and outcomes that you create decision trees just to help them know what to do from a sort of visually interactive, question asking perspective. Those questions could be simple yes/no answers or have their own questions again for each answer given and so on. The point is, you just want to walk them through the whole process and put down every possible scenario and outcome for each answer they choose since there are usually many different ways to do things and how they're done can depend on the result or outcome. Do you make decision trees for coming up with the content they can help you create? Or just because they're so helpful for the people that need to know? Making decision trees and flowcharts does help one to make the process systematic especially when we are collaborating as a group. However, I prefer to just do things spontaneously on my own as certain ideas and changes can be made where necessary. Wow--this is an awesome post. I would love to see more of these trees and to also create some of my own. I am a sucker for organizational modes and patterns such as this, and they provide a general structure which one can elaborate on and personalize through personal creativity and the extension of themes with proper development. The only time that I used decision trees was when I was still at the University. There was a particular topic on decision trees and flowcharts and I have to admit that I was not good at drawing flowcharts. I don't rely on decision trees for content creation but this seems to be very interesting. I have the writer's block at times and if those decision trees can help me then it is worthwhile to learn how to do these. I will try to do some more research. I like this idea. The advantage of decision trees is that they map your thinking process . Has anyone ever had to write an essay in school?You have all the material from your extensive research. However the process of breaking everything down into a flowing essay is the hardest part about the essay. That's why I like this suggestion it adds clarity to your though process especially when you have a lot of material to look from. I really like this. It's a fun way of organizing your thoughts and ideas. You're also making them out as future actions and possibilities for consumers. I'm sure this will help anyone with making the right choice. Very important @Steve5 when you are creating content. It is very easy to get all these ideas(all you have to do is consult uncle google). However putting down your content in a systematic and understandable way can be really difficult. You may have the content but if it is not organized you may loose your audience. Creating a decision tree is a really good way to deal with this and to help your audience.